Rosenthal names made history in design, demonstrating the charming way that folds classic contemporary rhythms, bringing praise fluidity of forms and indisputable quality. Over decades, Rosenthal has always remained alive and fascinating, united and motivated by the desire to create the best in design in every era, it’s motto being “What is original in our time”. Fame and respect enjoyed over time were based on features like purity, light, luxury, exclusivity. It is now one of the leading international suppliers of contemporary table and living culture.When looking for a special gift, when we choose for your homes a spectacular solution, when you decide the list for marriage, when you admire in museums world mass service which belonged to famous personalities you meet the name Rosenthal, are reasons that entitle us to try find out more about this company, which crossed the years with the same stately nobility, adapting to modern needs today. Company value is due to the quality of its products, the impressive and vast scenery, high level of creative art. 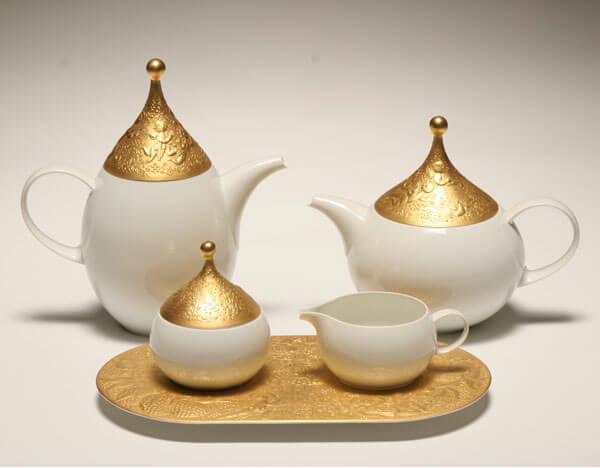 Dinner sets and accessories with lines drawn refined delight the viewer, like a fine jewelry, rich decor, spectacular, and fine porcelain hand painting. Since 1961 Rosenthal Studio-Line is a standalone brand which is part of the Rosenthal name brand. It’s described to be “ an idea that crosses borders. A concept in which people who appreciate the luxury of life feel at home and allow themselves to become inspired by a plethora of design. Our design roots go deep. They are firmly anchored in centuries of cooperation with the greats from the worlds of art and design and form the basics for the unhindered development of our creativity.” To mark half a century of Studio-Line, this year Rosenthal proposed a special limited edition: 50 vases bearing the signatures of renowned artists and designers were selected from works of the house from 1950 to today, to reflect the diversity and innovation in this division. Many of these objects have become today’s classic, timeless, being found in the permanent collection Rosenthal Studio-Line. Other pieces, taken from the archives, were returned to Rosenthal collection just for this anniversary. Every collection of dinner sets, glass series, gift-ware or accessories from this brand is unique and offers a refined combination of colours that maches perfectly. They are more than simple collections for kitchen, they are a completely new form of expression and lifestyle. Let yourself be inspired by their products, make a present of sheer delight or embellish your personal home!